Singing is the Best Way to Learn to Rhyme! This school year, I have the pleasure of teaching music to 120 kindergarten students at the newly-opened KIPP elementary school in Lynn, MA. Our school will add a grade each year, so for now, we are all K! It’s great fun. 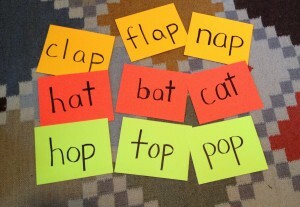 One of the first literacy skills kindergarteners need to master is rhyming. Distinguishing rhyming words helps emergent readers hear distinct vowel sounds as well as ending consonants, which are the same in each rhyme, and beginning consonants, which change from word to word. Children with great preparation in preschool or at home already may know about rhymes, but some children still struggle with the concept in kindergarten, especially English Language Learners. Everyone benefits from a review. One of the best ways to learn about rhymes is – music! I’ve already posted about these rhyming songs, but here is a reminder of some of my favorites. My version of Dr. Knickerbocker (the lyrics are in this link, to my Songs for Teaching page) is a terrific wiggle break and provides work on counting down as well as rhyming. Below are the rhyming pairs of words as you count down in the song. You can review them before the activity, or just have the children call out the rhyme at the appropriate time in the song. You can also do this as a chant if you don’t want to sing. Hey, Dr. Knickerbocker, number nine, it’s a great day and I’m feeling fine. Oh, let’s feel the rhythm in our hips, our hips, let’s feel the rhythm in our hips. This link will give you the rest of the lyrics. Animal Rhyming Words (especially great paired with the book, A Hunting We Will Go, adapted by John Langstaff). Songs & Stories from the Natural World! Antelope Dance | Powered by Mantra & WordPress.